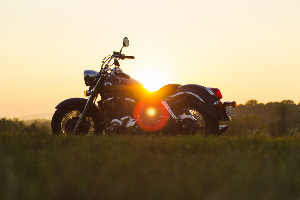 Approximately 75% of all motorcycle accidents involve a collision with another passenger vehicle. These accidents can have devastating results and may lead to life-long injuries and pain. If you’re a motorcyclist, preparing for an accident can help save your life. Knowing how to avoid motorcycle accidents and knowing what you can do in the event that an accident occurs can help you stay safe. Compared to four-wheel passenger vehicles, motorcycles are vulnerable on the roads because they are smaller and harder to see. Fortunately, there are many things that motorcyclists can do to avoid accidents. Over 90% of motorcycle accidents that occur on the road happen to cyclists who are self-taught or who learned to ride from a friend. Motorcycle safety courses can help you learn to avoid situations that commonly lead to accidents. If you’re an experienced motorcycle driver, take refresher courses on a regular basis to ensure that the material is fresh in your mind at all times while driving. Motorcycles are less visible than four-wheel vehicles. They’re smaller, have only one headlight, and often move differently than cars. To make yourself more visible, wear bright colors. If driving in the dark, wear a reflective jacket that will catch the light of oncoming vehicles. Turn on your headlight for driving at all times of day, not just in the dark. In the year 2016, one-third of all motorcycle drivers involved in fatal accidents were speeding. Speeding can increase the chances of an accident and can lead to fatalities. Drive the speed limit to keep yourself safe from cars that may not see you rushing up from behind. Distracted drivers are a serious threat to anyone on a motorcycle. People who text and make phone calls while driving can easily swerve between lanes and cause accidents. If a driver on the road ahead of you is driving in a way that seems erratic and unpredictable, stay back. If you must pass the car, honk briefly to ensure that the driver of the car is aware of your presence. If you are involved in a motorcycle accident, the steps you take following the accident could seriously impact you for years to come. Knowing what to do following an accident can help while you recover from injuries. Check yourself for injuries, check your passenger (if you have one), and check with passengers of any other vehicles. If anyone is injured, call the police as soon as possible. Do not move someone who is injured; instead, follow the instructions provided by the emergency dispatcher. If you’re able to get out of the roadway safely, move out of the way of oncoming traffic. Do not do this if you don’t feel up to moving. If you’re too injured to move, wait for the police. Exchange information with the driver of the other vehicle. Get the driver license number, name, phone number, insurance information, and license plate number. Be sure to note the license plate number and the make and model of the other vehicle involved in the accident. Following an accident, many people feel the need to take responsibility for the accident. Doing this prematurely could make it difficult to collect compensation for medical bills at a later date. Keep your interactions with the other driver and the police as business-like as possible. Do not apologize for any actions that you may or may not have taken. Get information from witnesses who may have seen the accident. As you talk to witnesses, take note of the surroundings. Write down what witnesses say and what you’ve observed. Draw diagrams if necessary. Work with a reputable motorcycle accident lawyer. A good lawyer can help you decide whether or not your accident warrants action in court. If you do pursue a case in court, working with a good lawyer can also help you get the compensation you need to pay medical bills and expenses associated with recovery. Your lawyer will need to see paperwork like medical bills, reports from the doctor, a copy of the police report, and documentation from your insurance company. Collect this information as you move through the recovery process to make your time with the lawyer more productive. If you have more questions about what to do if you are involved in a motorcycle accident, contact a reputable lawyer in your community. At Otorowski Morrow and Golden, PLLC, we’re happy to answer your questions about motorcycle accidents. Call us today to find out more. What Happens When the At-Fault Driver Has No Insurance?